exciting names in the early and contemporary music worlds. Re-appraising the Bard and Ming Dynasty playwright Tang Xian Zu (of Peony Pavilion fame), this lyrical and dramatic concert celebrates the meaning of Love - the physical, the spiritual and the transcendental. 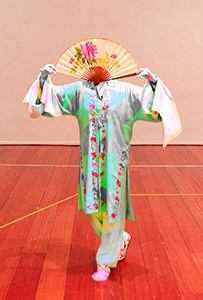 Based on a concept originated by Yeh Tsung and drawing from the refined kunqu opera music of the Peony Pavilion, and Elizabethan music from Shakespeare’s Hamlet and Othello, the work is enveloped and enjoined by the new music of one of China’s most accomplished composers Qu Xiao Song. Qu’s compositions have been widely performed in major cities, festivals and opera houses around the world. Renowned for his innovative performance language, Ong creates a cosmos of love, an evocative magnum opus exploring the differing yet connected philosophies on love, death, and the afterlife as represented by the works of two masterful playwrights who lived in two different cultures at the same time, who died in the same year (1616), but who were unaware of each other’s existence. This performance which will marry Elizabethan colours of the ancient cittern, recorder and viol, the kunqu flute with the instruments of the Chinese orchestra, is set to cast the 16th-century musical and literary worlds of the two revered playwrights in a new, imaginative light. The performance features three different music ensembles -11 accomplished musicians of the Singapore Chinese Orchestra known for their commanding virtuosity, led by Yeh Tsung; the Musicians of the Globe who are among the finest exponents of England’s early music, led by Philip Pickett; and the stunningly adroit kunqu opera actress Wei Chun Rong and her musicians from the Northern Kunqu Opera Theatre in Beijing. 3. At SISTIC outlets at various venues island-wide including Raffles City, Bishan Junction 8, Bugis Junction, Parkway Parade, Plaza Singapura, Millenia Walk, Novena Square, Singapore Conference Hall, Victoria Concert Hall and Vivo City.